A Welsh girl in Australia: Party week wrap up (part2) - a rugby fairy tale. 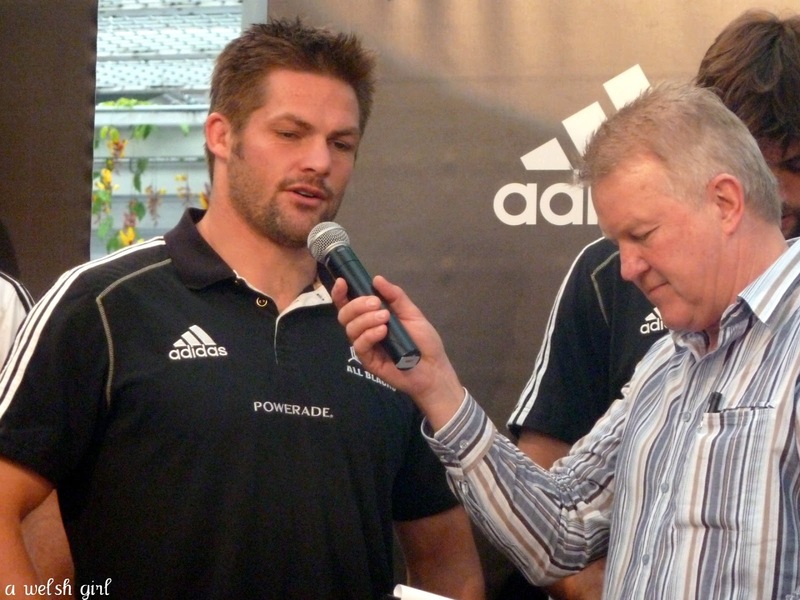 Party week wrap up (part2) - a rugby fairy tale. Apart from a birthday party there were a few other very exciting things going on in this house during this last week. I think I've mentioned before that my girl is a bit of a mixed bag when it comes to interests. She loves her ballet and music and all things pink and purple, but one of her other passions in life is rugby. 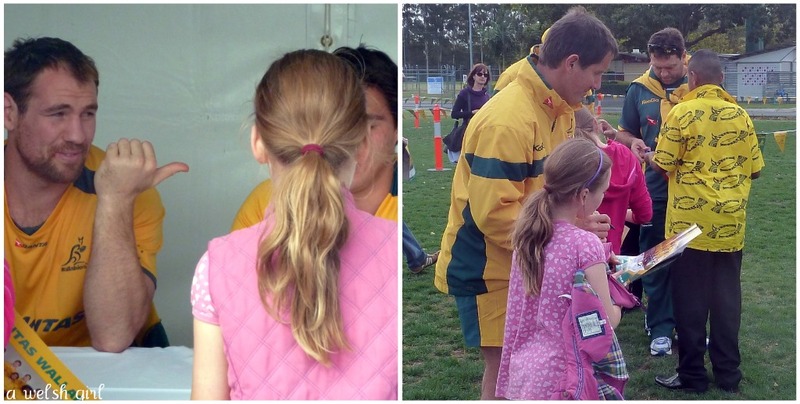 This birthday week she was even more fortunate to meet the Australian rugby team. She got the chance to play a game with other children against some of the players and got the team to sign a poster which is on her playroom wall. - Lucky girl. Sibs has a favourite team. 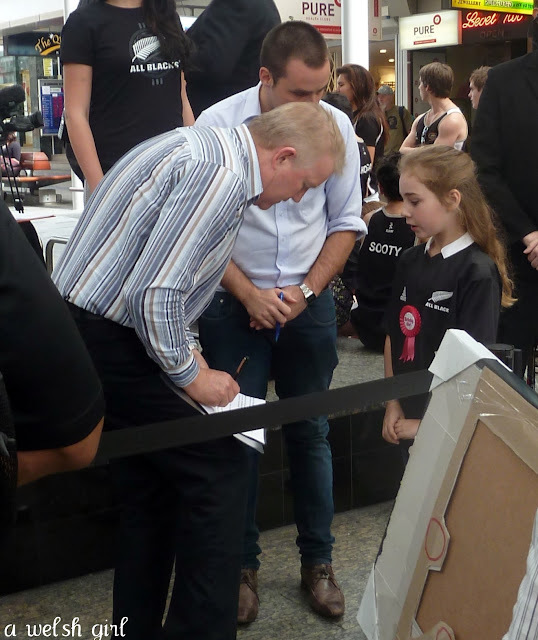 ...yet her favourite rugby team is the All Blacks from New Zealand! 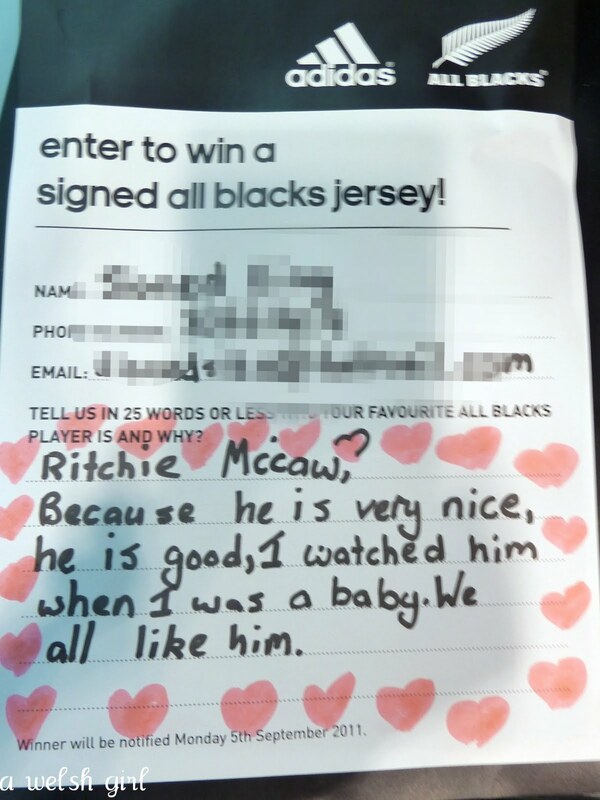 Ever since a holiday to New Zealand a few years ago when we happened to be staying in the same hotel as the national rugby team she has taken an interest in the All Blacks. She would sit in awe when the players arrived for breakfast and watch their every move. She loved the media interest outside the hotel and the hype of the locals hoping to catch a glimpse of their heroes. When we went back to New Zealand in January we had to go and visit Eden Park to see one of the stadiums where they play. 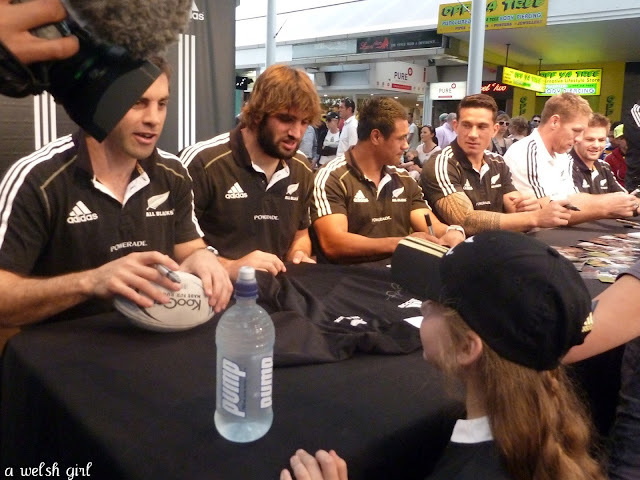 They All Blacks were playing in Brisbane on Saturday and we found out that they were appearing in the city centre for an hour on Friday morning. Could she get to see them? We let her know the plans the night before and she was so excited. It seemed to take her forever to fall asleep - it felt like Christmas eve! The next morning instead of her school uniform she was proudly wearing her All Blacks rugby jersey clutching the biggest sketch book she owns complete with two pens just in case one ran out! making sure Greg Clark knows how to pronounce her name! Whilst waiting for the players to turn up, Sibs was asked if she would like to go on stage and perform the Haka. (The Haka is a traditional Maori dance that is performed by the All Blacks Rugby team before a game.) So off she went with another three children and stood in front of hundreds and hundreds of people (millions according to Sibs!) Not only that, but joining them on stage were six of the All Blacks team! She was then presented with a cap, a scarf , a rugby ball and a huge poster....and then got to meet and chat with the players. She even made it onto the nightly ABC news and the Sky news! Well you top that by having your photo taken with your absolute favourite player...Ritchie McCaw. She had the biggest grin on her face in that shot. hmm...I wonder why he's her favourite player? What an experience for a nine year old - a birthday week that she will remember for a long time. Penblwydd Hapus my Sibsy girl. What could she have learnt from a day in school that would top that day?! How exciting! She is indeed a lucky girl. And yes, I can see why she likes Ritchie! We're also a Rugby loving family, and are in the same predicament. 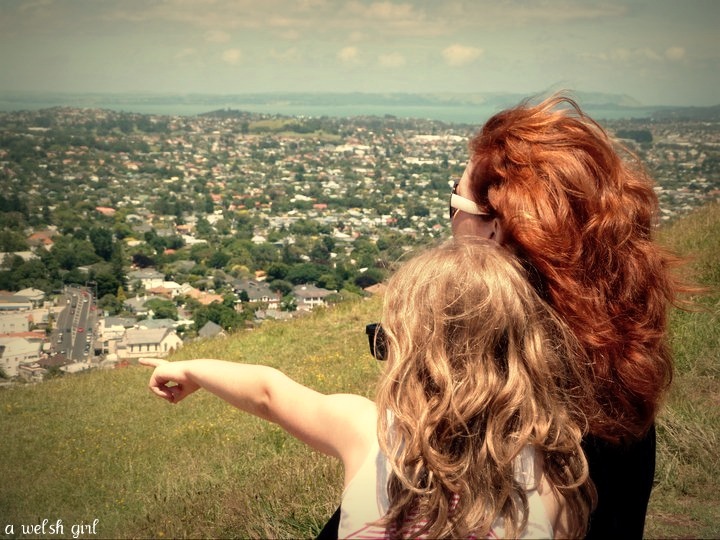 Mother (me) South African, father English and now also live in Australia. Who to support? For now, just the team that plays the best. What a fantastic story. A memory for a lifetime for sure. Thanks for sharing. Popping over from HH UK Post of the Month.